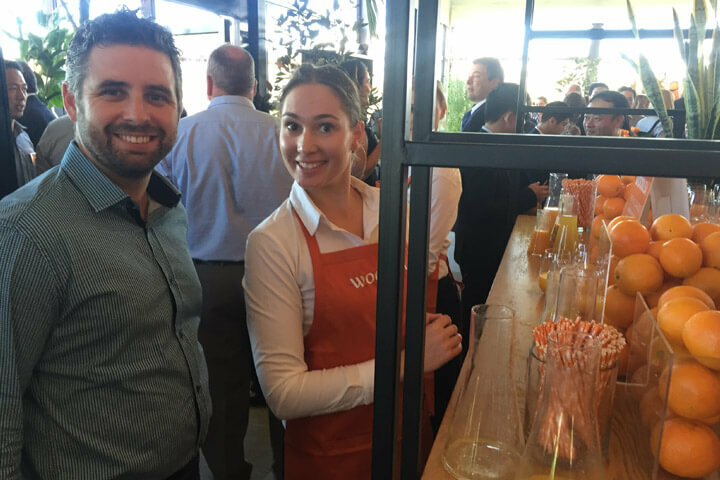 Woodlea, Australia’s fastest-selling community was officially opened at a VIP event on Friday 15 April by Victoria Deputy Premier, the Hon. James Merlino MP. The National Land Survey Program named Woodlea as the nation’s fastest selling masterplanned community during the December 2015 period. Averaging 81 sales per month, it outperformed its nearest Melbourne competitor in average monthly sales by over 50 per cent. The development, a joint partnership between Victoria Investments & Properties (VIP) and Mirvac revealed its display village comprised of 37 homes as well as other amenities, including a café, public park and learning centre located within the sales office. Principal Water Engineer, Leigh Holmes at the Woodlea Opening event. Woodlea is one of the first communities of its kind to deliver fully functional assets in conjunction with the first residents moving in. Community is a core focus for Woodlea, and ensuring that residents are provided with more than just the bare basics from inception is essential to fostering this. Woodlea, situated on 711 hectares in Rockbank in Melbourne’s west is currently forecast to be the largest masterplanned community in Melbourne’s western growth corridor. Spiire has been working with VIP and Mirvac since the early development phase in 2000 as the lead engineering consultant.